So I have been putting off this post forever because frankly I hate sharing my weaknesses. 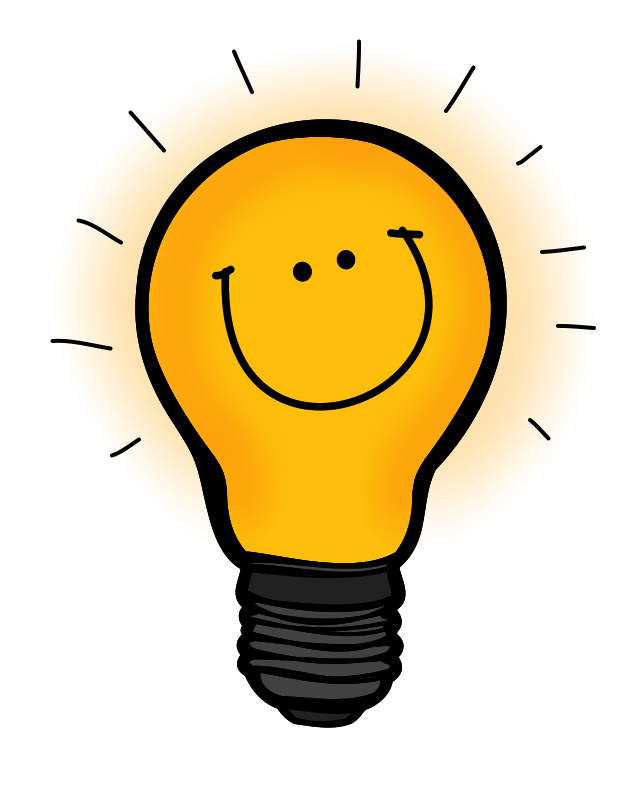 However, I have finally decided that this purpose of this blog is to help other educators by collaborating and sharing ideas and experiences so...here goes! I really have to start at the beginning...A few years ago our district adopted this elaborate way of rating teacher performance based on Marzano and his Nine Instructional Strategies for Effective Teaching. This has been a enormous change and huge task for teachers to understand exactly what it is evaluators are looking for when they come in. So at the beginning of last year we were asked to pick two target elements. These would be just two things that we were hoping to improve on throughout the year, easy enough right? HA! 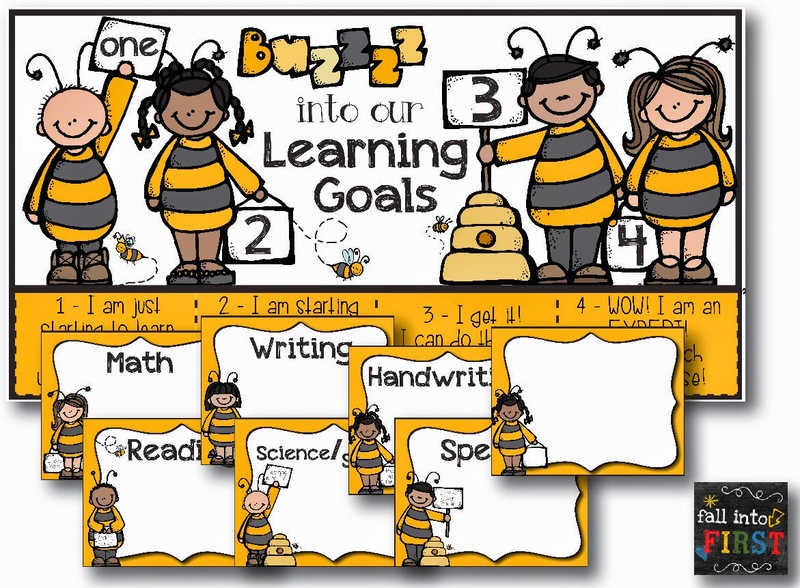 I chose to work on Learning Goals and Scales because during the previous year I had spent time creating my Marzano BEE themed scale (pictured below). Cute right? I had created several themes for other teachers at my school and I had these 4 signs hanging in the front of my room and I thought "All right I am ready to go, I am going to nail these Learning Goals and Scales!" The above signs are perfect for a classroom scale, they are generic so that I can use them throughout the entire day. The kids find them fun, I can quickly check their learning by asking them to write their number on the top right corner of their paper or check whole-group by asking kids to show me their fingers, love them. Scales, CHECK! However, I struggled ALL YEAR with Learning Goals. I know the learning goal, I know exactly where we are going by the end of the lesson, unit, year, etc... Do I really need to write it on the board for FIRST GRADERS! Some of them can't even read! For much of the year I considered it a waste of time, energy, and valuable white board space so I kinda faked it when my evaluators came in and...it didn't really work. Fourth quarter came and I still had not met my goal and panic started to set in. I was so mad that I had picked that goal and I was failing at it. I had to re-evaluate my thinking and you know as well as I do that is a really hard thing to do sometimes. 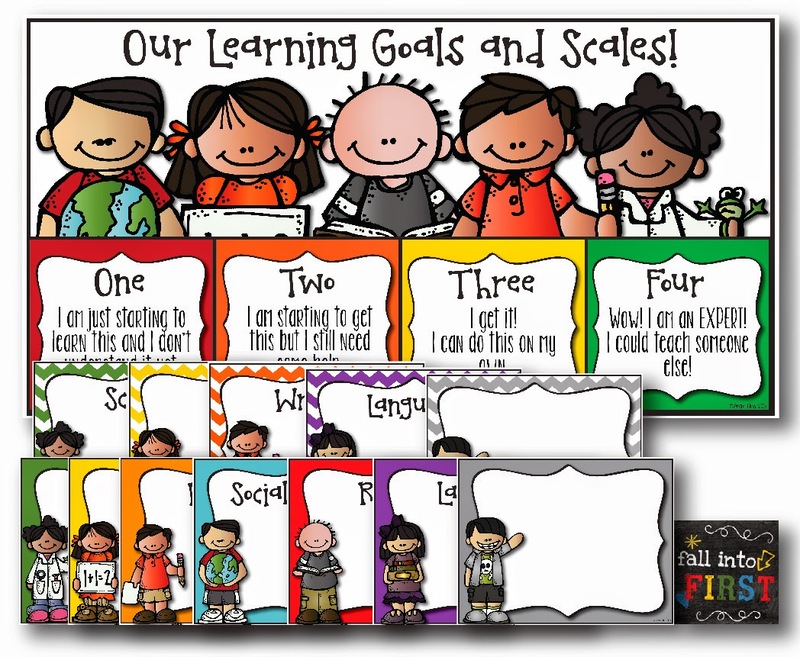 I decided it was time to UNITE Learning Goals and Scales. You are probable thinking "duh, they already were united" uh yeah, NOW I know. But, at the beginning of the year I really did not understand how to do that. Once that light bulb finally turned on I created this! I decided to change my thinking and to really try to focus on not just the scales but also communicating with students the learning goal and just see what happened. Well I have to give it to that Marzano guy...he may know what he is talking about :) Seriously, my students love it. I used my the wording from my smaller scales poster and created a banner to introduce our daily learning goals. The learning goals are displayed by subject in a Ikea frame so that I can use a white-board marker to easily change them. Best part, the frames are attached by Velcro so we can easily take them down. "I can add two-digit numbers with regrouping." I read them the learning goal and ask students to show me with their fingers where they think they are on the goal. I ask those kids who show me a 3 or 4, "tell me what you know". It is amazing because many times the kids are able to help kick start the lesson with their prior knowledge of the concept. Because the board are only attached by Velcro we take them down and put them under the document camera and identify what we already know and what we may not know. 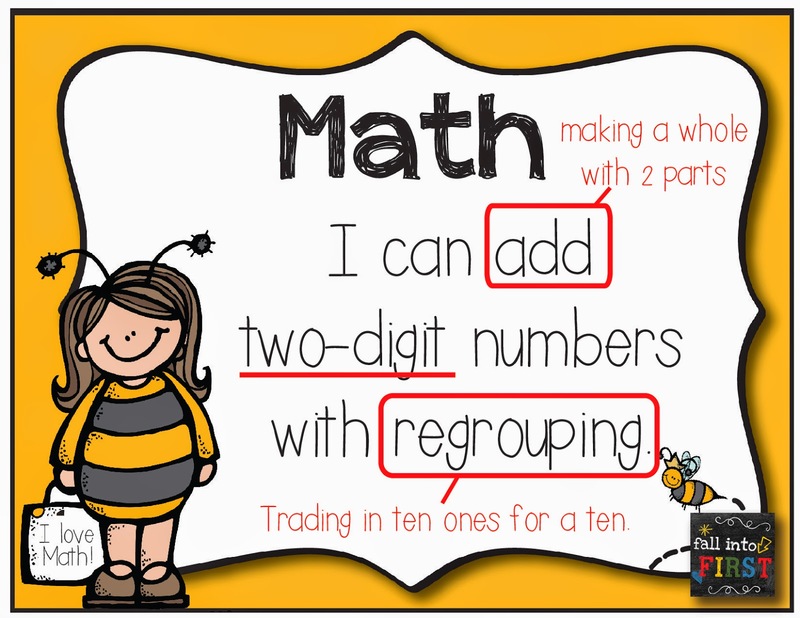 In this example, we already knew how to add and we already understood what a two-digit number was so we just briefly discussed those two terms. We spent a longer time discussing regrouping. We had practiced that concept before so the few minutes we spent reviewing it helped students remember that term. Usually during this time there are a lot of aahhs as they begin to remember and realize that they do know how to do this and its not so scary when you "unpack" the learning goal. Sometimes we re-check where they are on the scales but often times from here we can jump right into the lesson and students are ready to go. Of course, we always end our lesson by coming back to the goal and using our scale. I have learned a lot this year and I am not claiming to be an expert at learning goals and scales, but I am learning and changing daily and I am excited about the growth that I have made this past year. Since most people may not share my love of bees, I have also made a Melonheadz theme because who doesn't LOVE Melonheadz, am I right? Check that out by clicking on the picture below. I could not decide between the solid color objective pages or the chevron so...I included both! ENJOY! I will be back later this week to talk about this new product - Hint: This may be my Target Element next year! 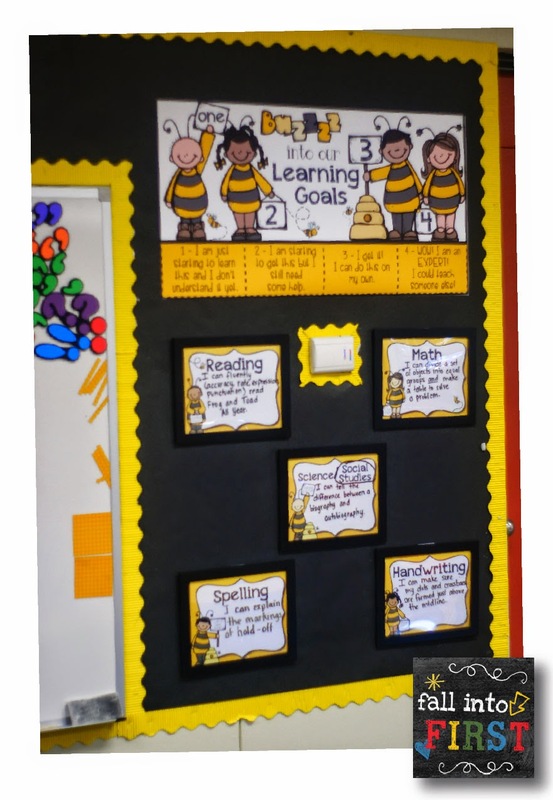 Angie, I love to see how you are using Learning Goals and Scales with first graders! 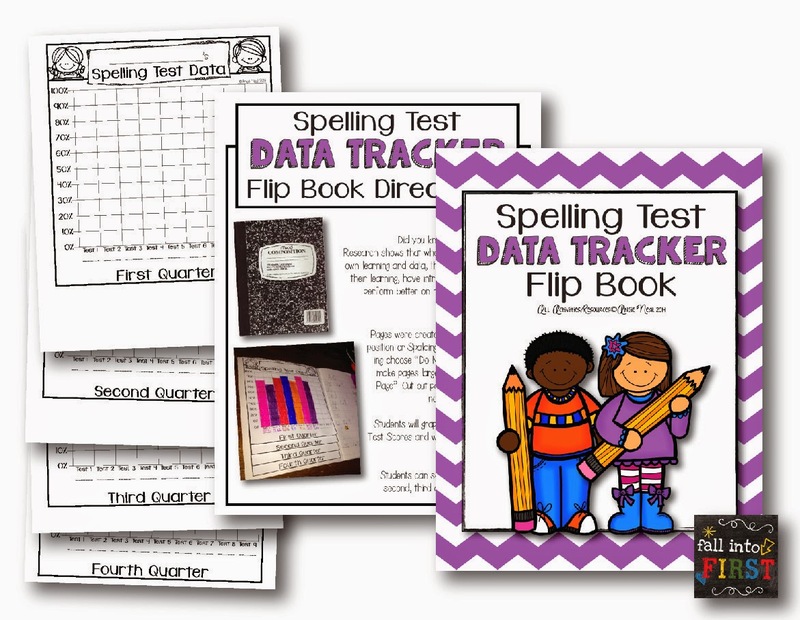 What a great way for them to become more aware of their learning process!